Volunteers with the church help distribute food at New Life Lutheran Church, as they have done for about 10 years now. 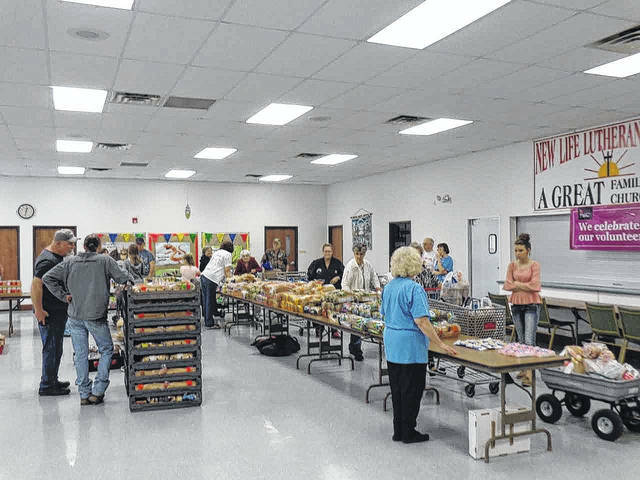 GALLIA COUNTY — New Life Lutheran Church takes steps in feeding the hungry in Gallia County. Once a month the organization hosts a truck from Lutheran Social Services that brings food, which the church distributes. The truck makes two trips a month to Gallia County; the first Tuesday to New Life Church and the third Tuesday of every month to Grace United Methodist Church on Second Avenue. The next date for the Lutheran Church is Jan. 23, not the first Tuesday of the month. According to Pastor John Jackson, the severe winter weather and low sign-ups beforehand prompted them to postpone until Jan. 23. New Life Lutheran Church is located at 900 Jackson Pike. They have been hosting the food truck for about 10 years. Jackson explained that nobody is ever turned away when they come the New Life for help. The food truck service will help anyone that stops by. The first time someone goes to New Life or Grace United, they need to bring some kind of government identification for everyone they are getting food for. There is a number that individuals can call ahead of time to make an appointment, which makes their process easier for those coming to the food truck and for the volunteers that coordinate the ministry. Even though the truck comes to Gallia County twice in a month, individuals and families can only received assistance once a month. To learn more about the food truck, individuals can call New Life Lutheran Church at 740-446-4889 or call 877-704-3663 to make an appointment with the food truck service.